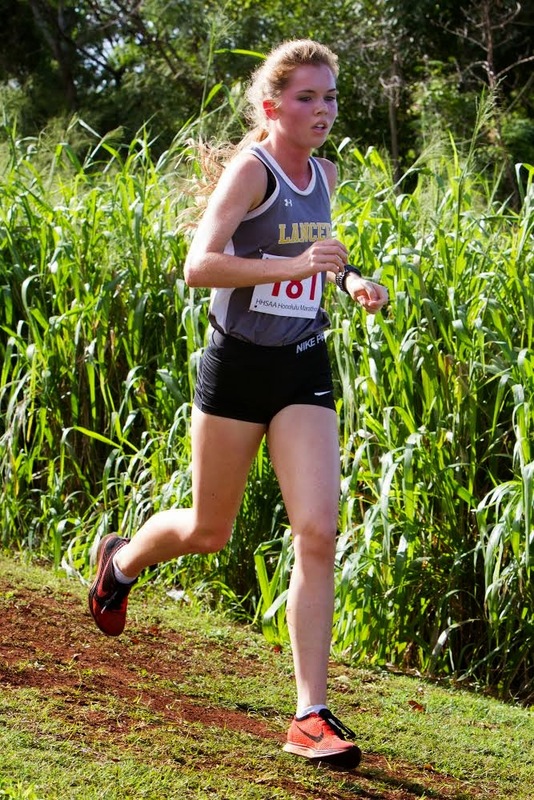 The Academy’s cross country runners faced some hills and valleys along their course this season, which culminated at the Hawai’i High School Athletic Association State Championships at Central Oahu Regional Park on November 1. Participating in her second cross country championships, junior Phoebe Kirk attacked the three-mile course, finishing in 19:46.34 and placing 15th out of 199 runners. Joining Kirk in the race were sophomores Monica Kirk and Michelle He, who both qualified for their first championship experience after strong finishes during the season. With this trio returning next year and a number of runners moving up to the Junior Varsity and Varsity level, the future looks promising for the Academy’s cross country runners, who participate as part of Pac-Five. Also competing this season, under the guidance of Pac-Five Head Coach Alton Motobu, were freshmen Kodeelyn Himuro and Megan Mattison on the JV level and eighth graders Amber Abara, Jessica Jorgenson, Arianna Radona and Ashley Ung and seventh graders Elizabeth Vinci and Jennalyn Wong on the Intermediate level. Celebrate the Holidays with Sugar Plums and Mice! Band Fundraiser with Papa John's Pizza Today!